Dr. Schlaberg is an assistant professor of pathology at the University of Utah School of Medicine. He received his MD and doctor medicinæ degrees at the Julius-Maximilians-University in Wuerzburg, Germany and his master of public health at the Mailman School of Public Health at Columbia University in New York City, where he also served as a postdoctoral fellow. 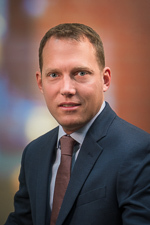 Dr. Schlaberg trained in clinical pathology at the Columbia University College of Physicians & Surgeons, where he was the chief clinical pathology resident. He is certified in clinical pathology and medical microbiology by the American Board of Pathology. His research focuses on the use of next-generation sequencing for unbiased pathogen detection and host response-based diagnostics.